After eating Easter chocolate all weekend you may be sick of the sight of it so what better time than to dispel all of the chocolate health myths we hear all the time. Let’s start with the difference between chocolate and cocoa/cacao. If you’ve ever mixed powdered cocoa into milk, or thought it would be a fun idea to take a taste of the powder while baking, then you know that it tastes nothing like chocolate. Cocoa and chocolate are by-products coming from the cacao tree and its beans. The beans are fermented, roasted, shelled, ground and turned into a paste before it can be made into either cocoa or chocolate. Removing the cocoa butter decreases the amount of sugar and fat, leaving mostly the high-level of antioxidants chocolate is known for. Cocoa looks the same but is not. Cocoa powder is raw cacao that has been roasted at high temperatures. This sadly changes the molecular structure of the cocoa bean reducing the overall nutritional value. The reported health benefits are found in the raw cocao powder or cacao nibs (bean). It shouldn’t come as a surprise that chocolate companies take advantage of the health benefits coming from raw cacao. They want to pull one over on you, convincing you of chocolate’s health benefits and charging a premium for ‘quality’ dark chocolate. 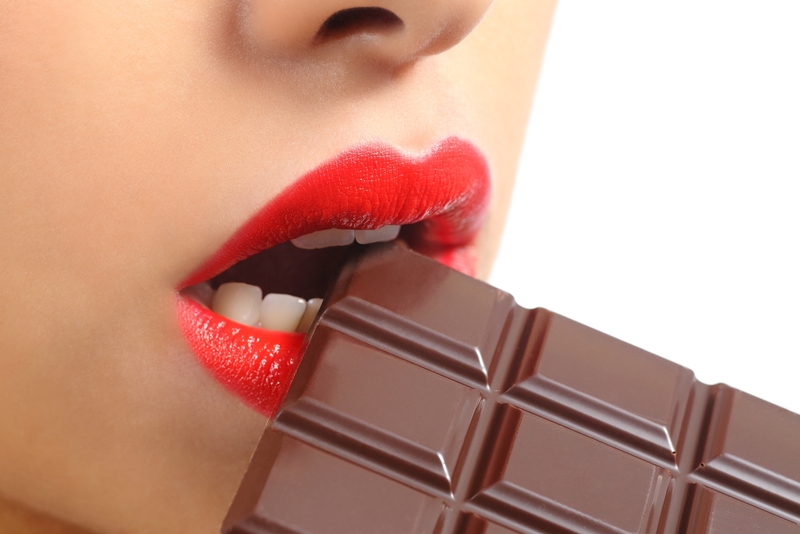 Sorry to burst your bubble… most chocolate in bar form is junk food. It doesn’t matter if it’s organic, dark chocolate or made from the cacao bean or not. Read the ingredients. If sugar is listed then it’s junk food that will raise blood sugar levels and contribute to fat storage. 1. The research studies that claim chocolate is full of antioxidants are actually referring to raw cacao not your average store-bought chocolate. 2. 70% dark chocolate can contain up to 250 calories for just 1.5 ounces or 4 squares. If you ‘treat’ yourself a couple times a week you will rack up an additional 2000 calories in one month. 3. Chocolate can be just as addictive as drugs. Cocoa products also contain pharmacological substances such as n-acylethanolamines. They contain stimulants such as phenylethylamine, which have an anti-depressant and amphetamine-like effect; and they contain compounds that stimulate the brain to release an opiate-like substance. When drugs are used to block the brain’s opiate receptors, the desire for chocolate (and other sweet and fatty foods) disappears — confirming the addictive nature of these types of foods. 4. Cocoa is very high in copper. The high sugar content in chocolate increases chromium requirements (chromium is an associated trace mineral to copper). The resulting high-copper / low-chromium ratio creates an increased risk for bone loss, and it can trigger or worsen blood sugar-related, and/or inflammatory conditions that may raise the risk or incidence of chronic tonsil infections, recurring bladder infections, some forms of arthritis, or similar problems of the immune system in prone individuals. 5. Dark chocolate is marketed as being high in antioxidants. This may be true but it also contains high amounts of copper, which unfortunately inhibits the action of certain antioxidants. This can lead to a greater incidence of vascular degeneration, such as varicose veins, hemorrhoids, aneurysms, bruising, heart disease, and stroke in those with elevated copper levels. Want the real health benefits of chocolate then ditch the sugar and fat laden chocolate bars. Even if you can just eat one bit, the sweet buttery taste entices you to keep on eating. Try eating it in the raw form such as Giddy YoYo chocolate bars. They are hand crafted and contain the world’s most nutrient dense highly mineralized cacao and unrefined sun dried cane juice and believe me, you won’t need much to be satisfied. Adding raw cacao powder to smoothies, chomping on raw cacoa nibs or making my chocolate avocado pudding below is the best way to incorporate the high-level of antioxidants and get the real health benefits found in the bean. Place avocado, honey, cocoa powder, vanilla extract and sea salt in a blender or food processor. Gradually add 1 tablespoon of water at a time to achieve a creamy consistency. < Previous The Truth About Eggs!